Local farmer rescues stranded blizzard victims – twice! 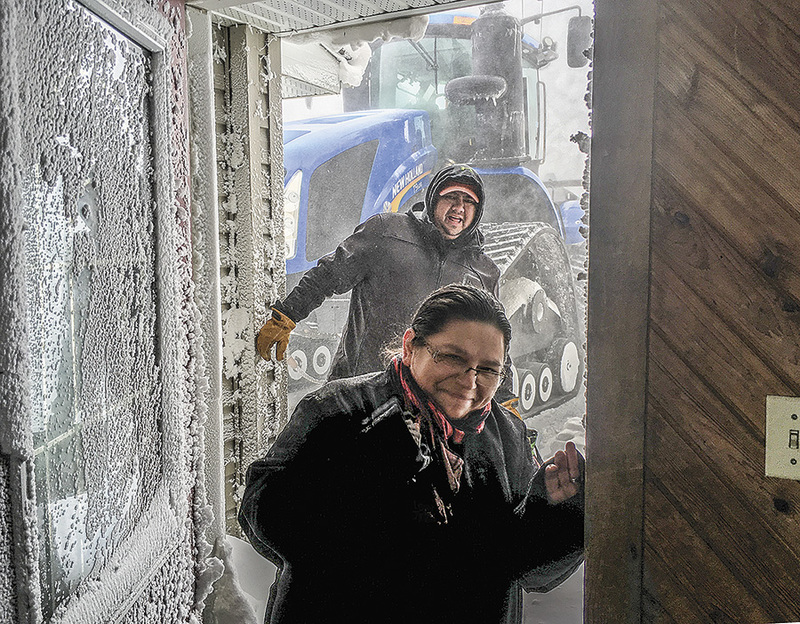 When a 41-hour blizzard began its long-winded assault on the southwest of the province Monday evening, a local farming couple could not have foreseen what lay ahead for them on the highway just outside their home. Dave and Adrienne Kroeker, who live 10 miles north of town on Highway 18, were about to be faced with the prospect of carrying out multiple dangerous rescues, ditching a running tractor – and savouring a wonderful meeting of three cultures under their roof. It started the following day, when local CAA tow truck driver Dean Kinley found he was unable to respond to multiple calls for help as the blizzard raged on, and zero visibility on roads hampered all drivers in the region. One of the phone calls came from a concerned Winnipeg business operator. That’s when modern technology came into play. Straightaway the Kroekers stepped into action. The driver, Subhash Goyal, a 38-year-old Piston Ring employee from Winnipeg, had now been trapped in his cube van for 17 hours. He expected to die there. But unknown to him, a few hundred yards away the Kroeker’s were marshalling a rescue attempt, despite the blizzard conditions. But the risks weren’t over yet. Dave Kroeker still had to shift Sunny’s van, which created a danger to traffic, off of the road, even if it put him in peril. Two hours later the Kroekers received another distress call. There was more trouble reported out on the highway, where winds up to 90 kilometres per hour were blasting the snow sideways. But this time Dave didn’t make it out to the highway. Inside the stranded truck were Swan Lake Band Leader Craig Solder and his wife Paula. The grateful pair joined Sunny Goyal in the Kroeker house, completing the storm-stayed party. Outside in the snow-filled ditch, the tractor remained tipped, its engine running throughout the night. Inside the Kroeker kitchen, Adrienne had to come up with an emergency menu plan for her unexpected guests. It was not a simple task. The following day the buried tractor was discovered still running, and although the throttle was stuck, they eventually got it out, she said. Around 9 a.m. the highways’ plough went by, and Highway 18 was once again open for business. The happy guests were able to get back on the road. Earlier that same Wednesday morning, at around 8 a.m., Kinley was already on the road, and on his way to help waiting and desperate trapped motorists. Kinley also got a text from his Piston Ring contact in Winnipeg, thanking him for his help the previous day, and insisting that he join him for a steak dinner. “Basically my job was to find Sunny the help that he needed to be safe,” said a modest Kinley. The Kroekers believe they enjoyed a rich experience, in spite of the hair-raising blizzard rescue events. 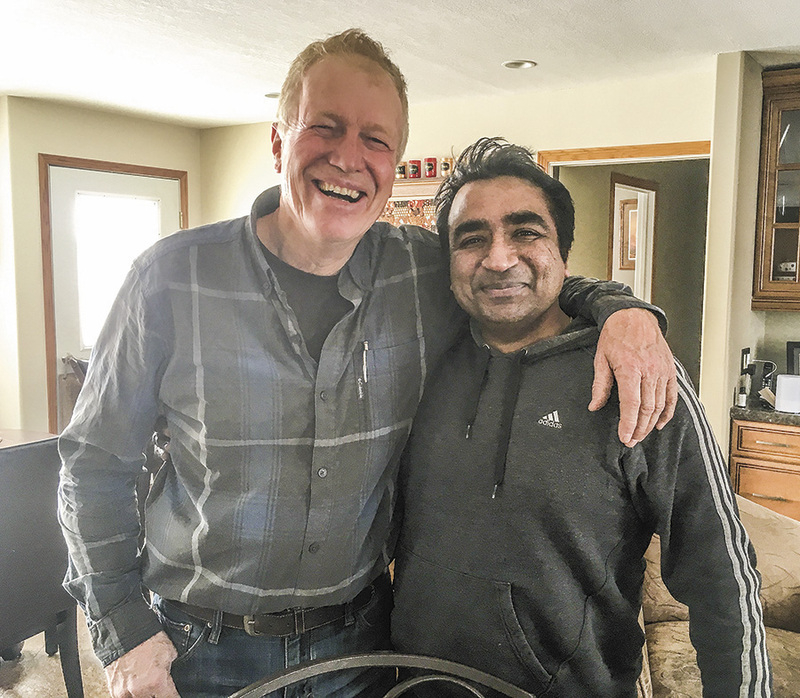 HAPPY TO BE ALIVE – Subhash ‘Sunny’ Goyal (right) spent 17 hours trapped on Hwy. 18 inside his Piston Ring cube van during this week’s blizzard, until Dave Kroeker (left) got on his tractor and rescued the Winnipeg man. ANY PORT IN A STORM – Craig and Paula Solder, from the Swan Lake Reserve, found a place to weather the storm after being stranded on Hwy. 18 near the Kroeker farm. Dave Kroeker rescued the couple with his tractor, and they spent a blizzardy Tuesday night with the family. 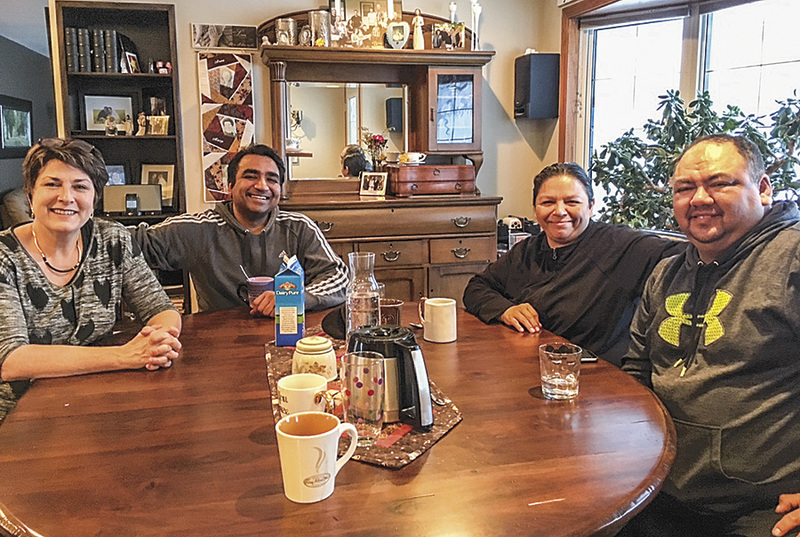 SAFELY GATHERED IN – Adrienne Kroeker (left) welcomed storm-rescued visitors Sunny Goyal (second from left), and Paula and Craig Solder (right) to her generous kitchen table for supper, dominoes, and breakfast the next day, after all three were trapped on Highway 18 – just outside the Kroeker home – during Tuesday’s dynamic blizzard. 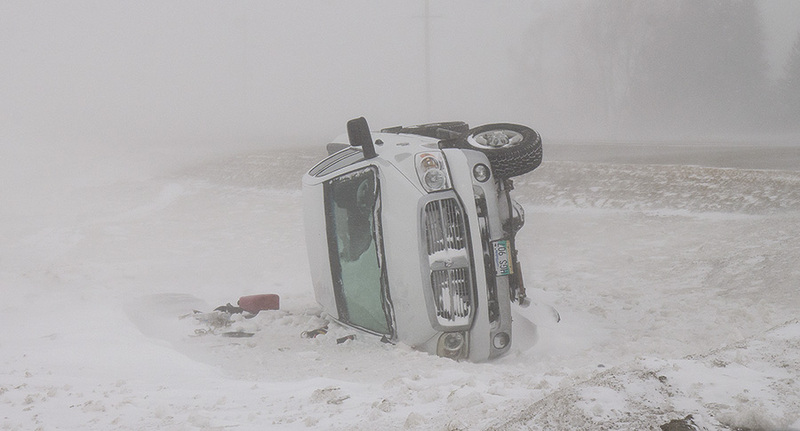 WINTER WHITEOUT WREAKS HAVOC – Highway 18 and all roadways in southwestern Manitoba were dangerous places to be from Monday night until Wednesday morning. High winds, at times upwards of 90 km/hour, created whiteout conditions with zero visibility, stranding motorists and causing accidents. This truck almost made town, before finding its way into the ditch and flipping on its side, just across the road from the Manitoba Hydro office, and across the highway from the Killarney Vet Clinic.